Tick Yes strategies and programs deliver loyal and more profitable customer relationships. Our Digital Transformation Process ensures that we achieve optimal results for our clients and their brands by identifying and implementing the most effective digital and social media strategies. The results of our digital projects are measurable, making sure you have transparency on the dollars spent for each channel. Targeted Email Marketing has proven time and again to be the most powerful pivot point for database asset owners. We have created and implemented over 200 successful email marketing campaigns for organisations of all sizes. The engine room of digital engagement, the Tick Yes team of content creators has experience creating thousands of original pieces of written, electronic and visual content. We have produced content for a wide spectrum of brands, target markets and subjects. Social media is just one of several media channels organisations need to take advantage of today. Our “one size does not fit all” approach to social media marketing, ensures that clients receive individually designed packages and thereby enjoy realistic outcomes. Acquiring, retaining and leveraging meaningful data from key stakeholders is an often under-utilised asset for organisations. In this age of ‘Big Data’, Tick Yes has undertaken over 50 major database projects since 2001. Designed to assist organisations with how to evolve and take full advantage of the digital communications revolution. The unique advantage we offer in consulting clients, is that we combine extensive commercial experience with digital communications knowledge and expertise. HCP ConnectTM is a strategic end-to-end program that enables pharmaceutical and healthcare companies to create integrated digital connections with targeted Healthcare Professionals. Everything we do needs to have a reason. Our process allows us to understand your brand, your environment and your individual needs. We focus on the end result and work backwards from there, to ensure we achieve your goals. To start we get a thorough understanding of your objectives, your markets, your assets, your people and the competitive environment. We then develop and present to you a detailed strategy and a tactical road-map to match your goals. Each step of our plan is sequentially outlined, so there are no surprises, only clarity. Once the plan has been implemented, we re-group to assess results, key learnings and the impact on your organisation. We evolve the plan by building on what has already been achieved in order to continue delivering results for your brand. We engaged Tick Yes to help us create a holistic digital strategy for the business. By engaging with key stakeholders, their digital expertise enabled us to develop an integrated roadmap with them designed to help us to better serve our customers and to drive sales. We were delighted with the outcome and continue to work with Tick Yes to realise our digital opportunities. It is such a pleasure working with Tick Yes. The team are always so reliable and responsive, nothing is ever a problem and they go above and beyond to get the job done right. They have proven to deliver high quality programs on time, every time. And always try and improve on past performance. It’s great to have such an innovative partner to help our business be successful in digital strategy and execution. We’ve greatly enjoyed working with the Tick Yes team, who have brought both gusto and precision to the projects we have tasked them with. We’ve appreciated having access to the full brains trust of the team as often as we required; their creative work is clever and their client service is thoughtful, enthusiastic and immensely efficient. We look forward to working with Tick Yes again soon. The service, commitment and pro-activity Tick Yes demonstrated was second to none. We've been working with Peter and his Tick Yes team since 2009 and it has been a pleasure to work with professionals who can balance the need for adhering to process and policy while achieving marketing objectives.. The value Tick Yes offered us was from creating the strategy through to implementation. We were very impressed with the service as well as the results that the promotion achieved. During this period, Rexona registered its highest ever market share. ...the innovative activities Tick Yes was responsible for certainly contributed to that fantastic result. Dealing with Tick Yes was a delight due to their professionalism, passion, pro-activity and knowledge. On top of that, they sought to understand both our business and our needs. If you are looking for innovative solutions that achieve exceptional results, I recommend you use Tick Yes. Tick Yes created an integrated offline and on-line program which exceeded expectations. We achieved challenging sales growth target, a high number of first time users and increased brand awareness. With Tick Yes we can now operate more effectively in a medium which is foreign to us and the industry we work in. the lessons of love to the world of business and marketing. Interesting, well-written and loaded with examples that demonstrate the effectiveness of a ‘romance’ approach to creating customers. I love, love, love this book. It’s fresh, interesting and very insightful. Romancing, wooing and winning your customer into a long term relationship is the key, in love, in life and in business. 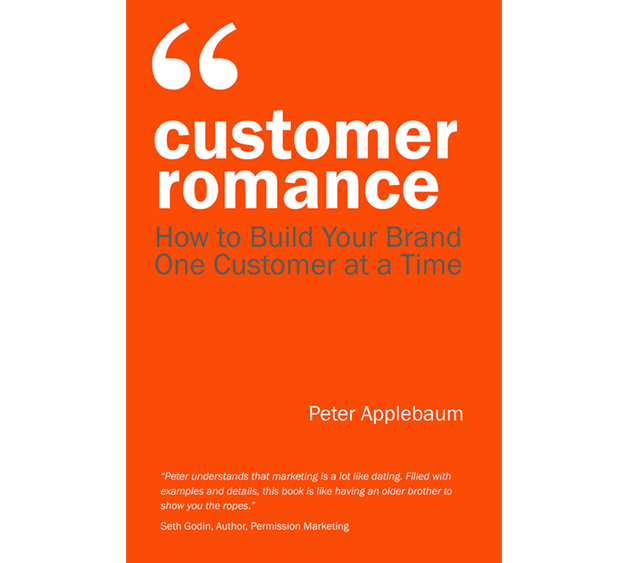 Peter Applebaum marries these concepts together to create pure love between you and your customers. If marketers were better at putting themselves in the shoes of the customer, every business would offer consistently great service. Peter's book, offers great tips for modern marketers in harnessing the power of social sharing, especially for those who sometimes forget our customers are our lifeblood. Peter understands that marketing is a lot like dating. Filled with examples and details, this book is like having an older brother to show you the ropes. Any marketer is only as good as their customers are good to them. Peter's book provides terrific insights and a fantastic reminder that each and every day customer relationship pay our way. Whether you are an experienced marketer or just starting out, Customer Romance is packed full of practical advice and examples to help establish or rekindle the romance with the most important people in your business' life – the ones who pay you money. An excellent guide to enchanting your customer and filled with the collection of examples in business books. Guy Kawasaki, Author of Enchantment and former chief evangelist of AppleAuthor of Enchantment and Former Chief Evangelist of Apple. Customer Romance is easy to read and easy to implement. If more companies used the principles in Peter’s book they’d achieve better outcomes. Business and fun are not mutually exclusive, Customer Romance proves that. For over a decade, Managing Director Peter Applebaum has been an in-demand media commentator appearing regularly on SKY Business and A Current Affair and is frequently quoted in BRW, Marketing Magazine, B&T and The Australian. Do you have a marketing or digital transformation challenge? To see if we can help, contact us by filling in the form below or calling us on (02) 9387 3244.